1 of 4 Heat oven to 400 degrees F. Cut squash on the diagonal into 1/4-inch slices. Season with 1/4 teapoon each garlic salt and pepper. Spray 2 baking sheets with cooking spray and place squash slices on pans. Bake at 400 degrees F for 20 minutes. 2 of 4 Season tomato slices with remaining 1/4 teaspoon each garlic salt and pepper. Spoon 1/3 of the diced tomatoes into the bottom of a large nonstick skillet. 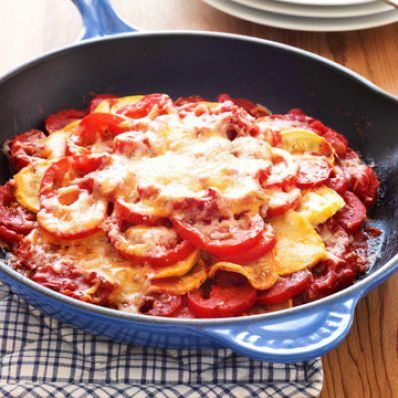 Layer half the squash, half the tomato slices, 1/3 of the diced tomatoes and half the cheese. Repeat layering. Top with Parmesan cheese. 3 of 4 Cover and simmmer for 25 minutes over low heat. 4 of 4 Meanwhile, prepare pasta following package directions. Per Serving: 11 g Fat, total, 60 g carb., 7 g sat. fat, 34 mg chol., 13 g fiber, 886 mg sodium, 30 g pro., 458 kcal cal.